You can enjoy the convenience and great taste of draft beer anytime and almost anywhere inside or out, thanks to Marvel’s complete line of draft beer dispensers. It’s the ultimate in home entertaining, style, and luxury: fresh, cold beer, wherever and whenever it’s needed. The Marvel® Draft Beer Dispenser line hides kegs from sight while keeping them cold, and includes all the parts necessary for great times “on tap,” including the draft arm, hoses, CO2 tank and regulator, drip tray, and interior floor shield (see accessories to learn more). 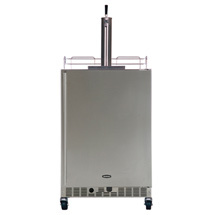 Undercounter and freestanding models are available; each can accommodate either a half- or quarter-keg. Customize your Marvel® Outdoor Series model to exactly meet your needs! We’ve got all the extras you want, all guaranteed to be a perfect fit for your Marvel investment. Makes mobility a breeze! Available for Models 6OAR-SS-F, 6ORGD-SS-F, 6OSWCE-SS-F, 6OBAR-SS-F, 6OHK-SS-F. Casters are standard on 6OHK-SSX-FF. 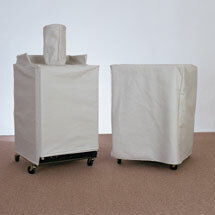 Made of heavy-duty 23-ounce PVC vinyl, with polyester non-woven back, these custom-fit covers are available for models 6OAR-SS-F, 6OSWCE-FF-S, 6ORGD-SS-F, 6OBAR-SS-F and 6OCiM-SS-F, 6OHK-SS-F and 6OHK-SSX-F.
Vinyl cover for Models 6OAR-SS-F, 6OSWCE-SS-F, 6ORGD-SS-F, 6OBAR-SS-F and 6OCiM-SS-F. Door lock is available for models: 3OAR-SS-F, 6OAR-SS-F, 6ORGD-SS-F, 6OBAR-SS-F, 6OSWCE-SS-F, 6OHK-SS-F and 6OHK-SSX-F. 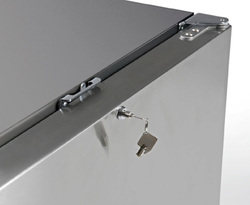 Door lock is located in door top center. Built-in drain for overflow beer. Four-piece kit includes stainless steel drain pan, grille, hose, catch bottle. Installation requires drain hole drilled in cabinet. Kit includes everything to quickly clean tap. Includes cleaning solution, pump, mixing bottle, brush, wrench. Kit Includes tap, CO2 tank and regulator, hoses, draft arm and hardware. Basic drip tray and grille. Lines floor to protect inside liner.